Celebrate St. Patrick's Day with parades, 5Ks and parties in Atlanta. 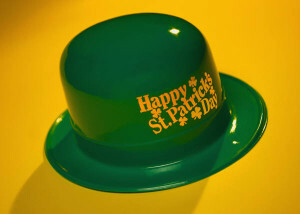 St. Patrick’s Day, a day to celebrate Irish history, heritage and culture is Monday, March 17th. The day began as an Irish religious feast day honoring their patron saint, Patrick. Today, it is an international festival celebrating Irish culture with parades, dancing, food and music. March 17th is the anniversary of the death of St. Patrick in the late 5th century. According to the History Channel, St. Patrick was actually not a native Irishman. He was born in a noble family in Britain and at the age of 16 was kidnapped and enslaved by Irish raiders. After Patrick escaped from his captors a few years later, he returned to England and joined the church. He went back to Ireland to convert the Irish pagans to the Roman Catholic Church. The Irish have observed St. Patrick’s Day since the 9th or 10th century as a religious holiday. Irish immigrants brought their St. Patrick’s Day traditions to American in the 1700 and 1800’s. The first major St. Patrick’s parade was held in Savannah, Georgia in 1813 and is still held today. There are more than 100 parades held in cities around the world to honor St. Patrick’s Day. The largest parades in the United States are held in New York City, Boston and Savannah. New York City’s parade is the largest with over 150,000 participants and 3 million spectators. The Irish government joined in the joyous celebrations in 1995 with parades, concerts and fireworks including a big parade in Dublin’s city center. There are many great events in the Atlanta area to celebrate St. Patrick’s Day from celebrating with family at parades to more adult oriented events at local area restaurants and pubs. March 15th is the day to celebrate St. Patrick’s Day in Atlanta. The day kicks off with the Atlanta St. Patrick’s Day 5K Race. The 5K walk or run starts at 8:30am at Piedmont Park. The proceeds for the race go to neighborhood charitable causes. Atlanta’s St. Patrick’s Day Parade kicks off at noon in Midtown Atlanta. The parade starts at the Woodruff Arts Center on Peachtree Street and marches down to 16th Street. The parade dates back to 1858 and is one of the oldest parades in the country. It has been held continuously since that time only being cancelled during World War I and II. The parade is produced by Atlanta’s St. Patrick’s Parade Inc. with representatives from various Irish organizations and communities. The parade has floats, pipe and drum corps, marching bands, dancers, drill teams and much more. The Budweiser Clydesdales are also participating in the parade this year. In 2013, there were over 2300 parade participants, 88 parade units and over 80,000 viewers of the parade. After the parade, the St. Patrick’s Day celebration continues at Atlantic Station’s “Shamrock the Station” until 6pm with family friendly fun activities including crafts, sand art, clogging music and more. For the older crowd, the Shamrock Music, Food and Art Fest is being held at the Masquerade Music Park. There will be tribute rock bands, food trucks, beverage tents, prizes and entertainment. However you celebrate St. Patrick’s Day in the Atlanta area, have a safe and enjoyable time! Slainte!